The 9/11 Memorial of Maryland is dedicated to Maryland’s 9/11 victims, rescuers, first responders, and their families. The Memorial provides a tranquil place for visitors and family members to remember and reflect upon the events of Sept. 11, 2001. 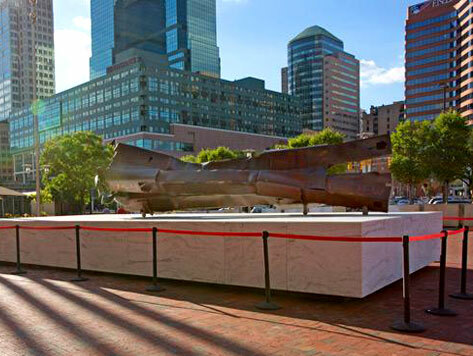 The Memorial is located on the plaza between Pratt Street and Baltimore World Trade Center, and is accessible for public viewing. Its main focal point is an artifact from the Twin Towers – a 22-foot-long steel artifact, consisting of three twisted and torn amalgamated steel columns accompanied by three limestone artifacts from the Pentagon and a large black granite monolith representing those lost in the Shanksville, PA crash. Additional information about the Maryland victims, along with artifacts from the Twin Towers and the Pentagon, and items from Flight 93 can be seen at a special exhibit in the Top of the World Observatory on the 27th Floor of the World Trade Center.